After checking out of our hotel the Travelodge, Norwich Central Riverside and leaving our luggage to collect later in the day, we walked across the city to visit Elm Hill. 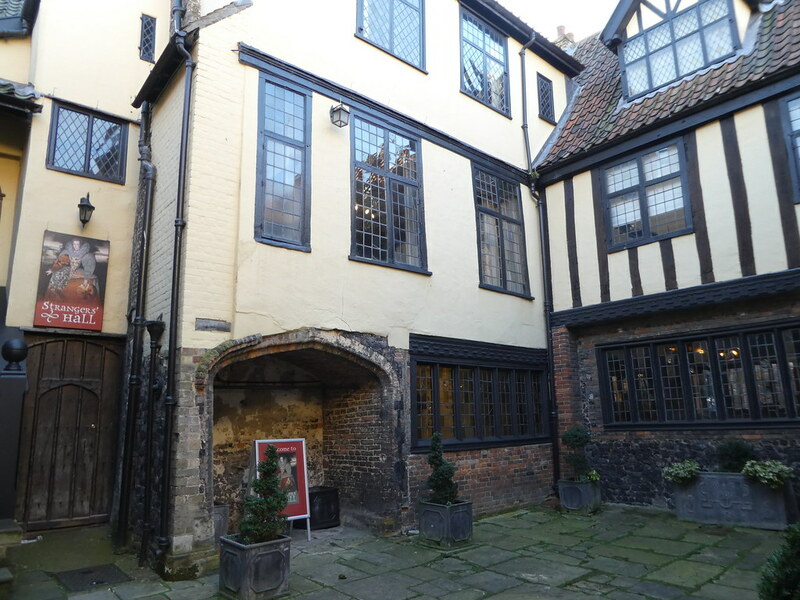 This historic, cobbled lane is the most complete medieval street in Norwich with many of its buildings dating back to the Tudor period. The photogenic properties, some with thatched roofs, were once the homes of merchants and are now small speciality shops and inviting little cafes. Our morning stroll continued through the narrow lanes of central Norwich, passing the cathedral to the river at Pulls Ferry. 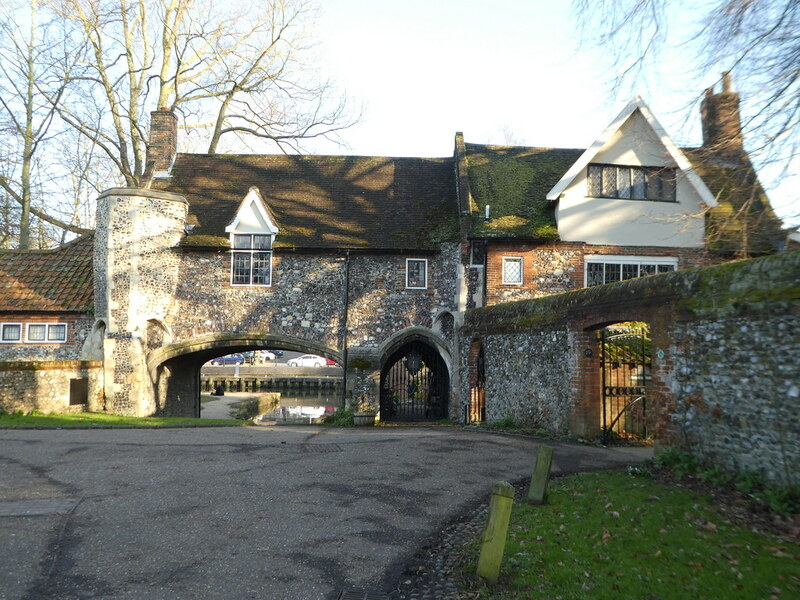 This stone arched building was once a 15th century watergate from where the Norman’s ferried stone from quarries in northern France to build Norwich Cathedral. A gate to the side of the building marks the riverside path which we followed in the morning sunshine. A few minutes further on and we had reached the 15 metre high Cow Tower built in the 14th century. 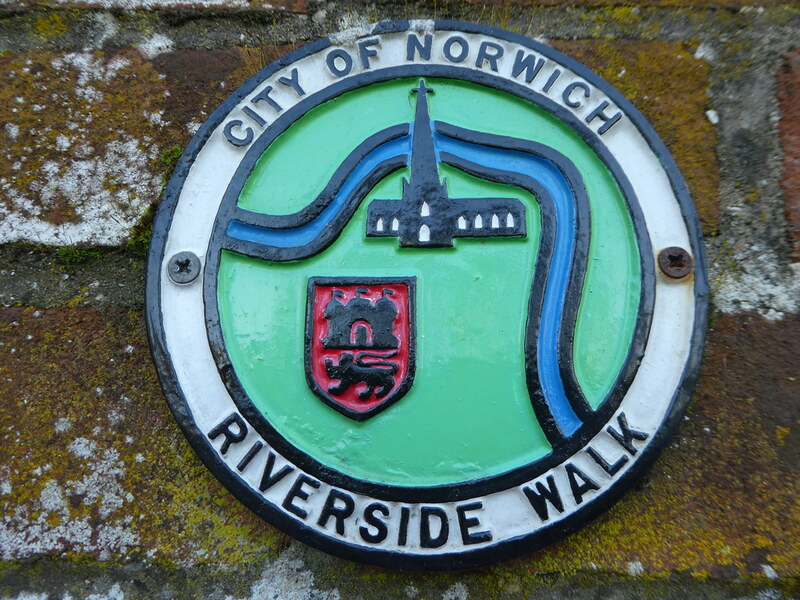 From there, the river takes a sharp turn to the left and the banks take on a more modern appearance passing modern waterside apartments, a former textile mill and the Norwich City Football Club. Nearby, we left the river and made our way back towards the city centre, pausing to admire the beautiful Dragon Hall which used to be a medieval merchant’s trading hall. It’s Great Hall was built in the 15th century but some other parts of the building are even older. 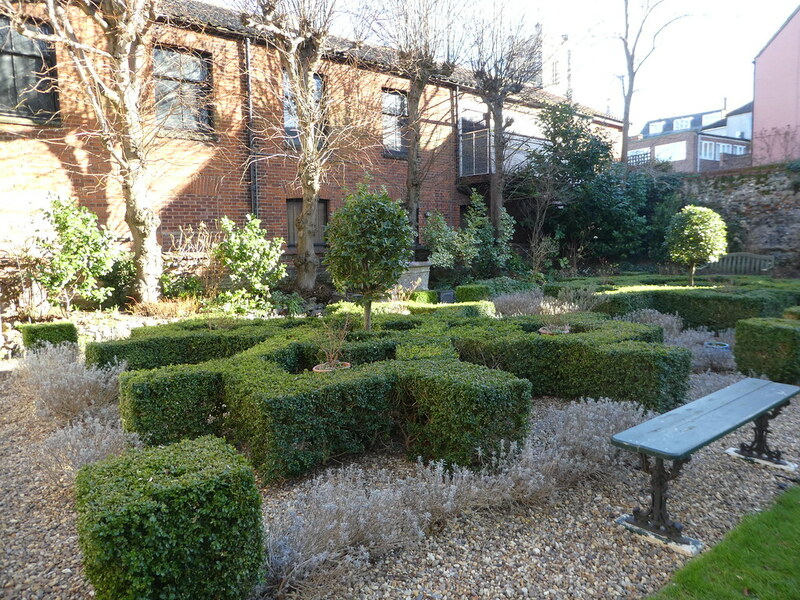 The building is currently being renovated and extended and will open as the National Centre for Writing in the summer to support the rapidly changing world of writing. As someone who spends quite a lot of time writing, this sounds very interesting and I’ll definitely be looking into its facilities once it’s underway. Our morning exercise had left us feeling hungry so we headed to the local branch of John Lewis for a pot of tea and slices of their delicious chocolate fudge cake. Sitting in the cafe’s sunny conservatory, it felt like spring was around the corner. There was still one more museum we wanted to see and as it’s only open on Wednesdays and Sunday afternoons at this time of year, we just had time to squeeze in a visit before heading back home. 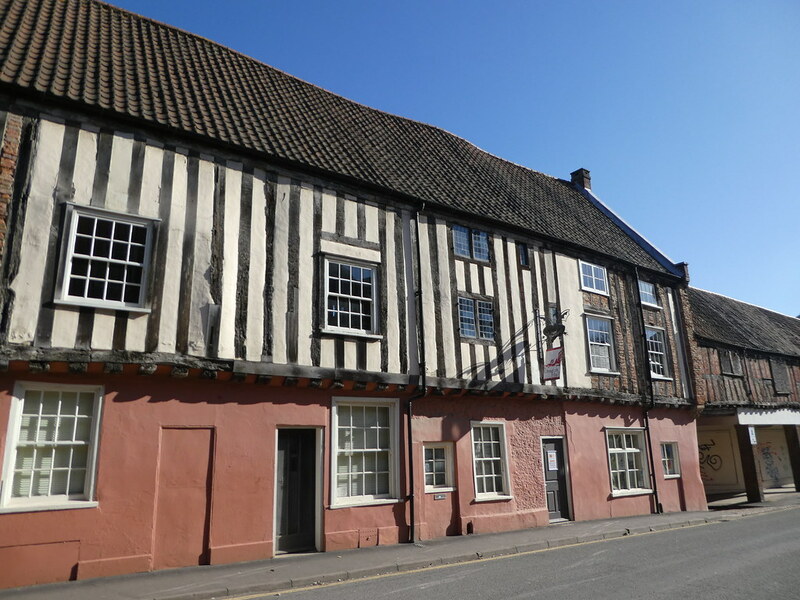 Strangers’ Hall is another of Norwich’s historic buildings, this Tudor house has, since the 14th century, been home to several of the city’s merchants and mayors. By 1890, Strangers’ Hall stood empty until a local solicitor saved it from demolition and ten years later opened it to the public as a folk museum. The building looks quite small from the exterior but stepping inside we found it to be deceptively spacious. Entering the Great Hall, it was easy to see that this was the heart of the medieval home. 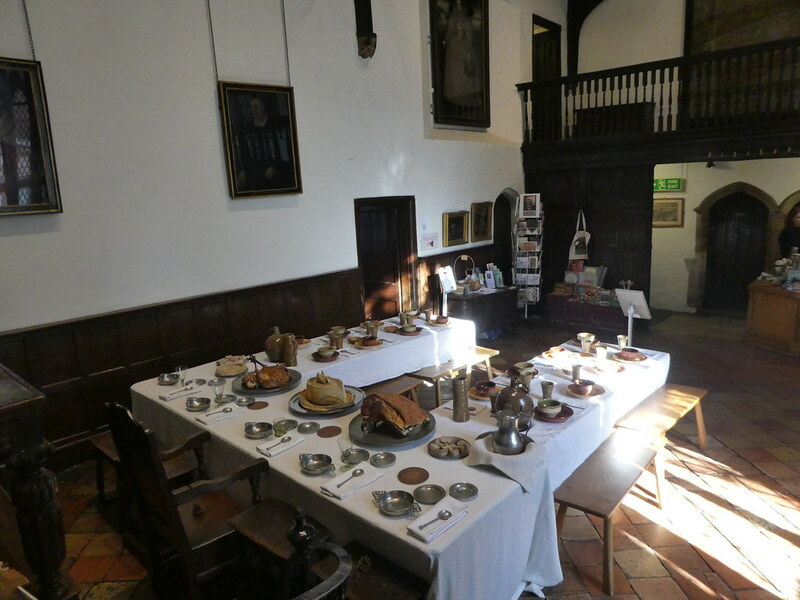 The huge oak table was laid out with fine tableware, pewter and a feast for guests to enjoy. From the Great Hall, an oak door leads out into the garden with old fashioned varieties of rose bushes surrounded by traditional box hedges. 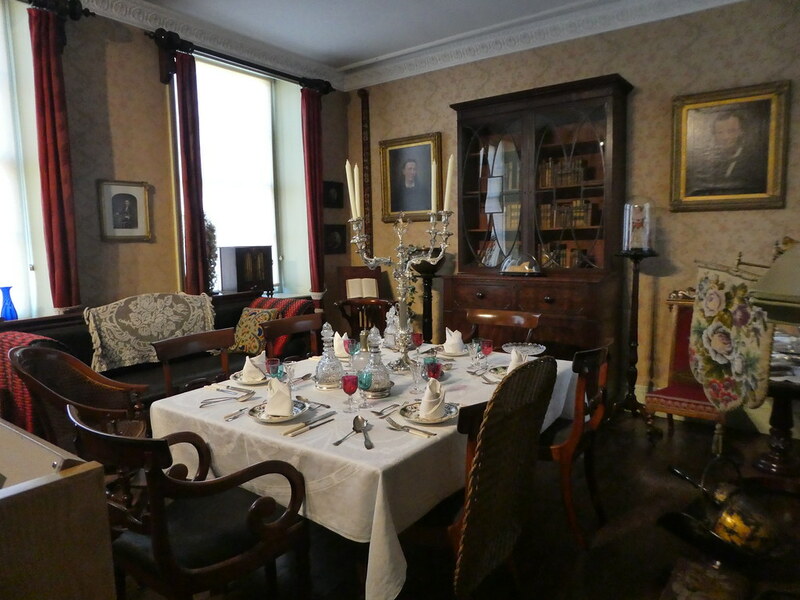 Back indoors, we toured the rest of the house and going from room to room we were able to see how a family lived from the 14th to the 19th centuries. Each room was presented in the styles of its successive owners and showed how the architecture of the building had changed over time. 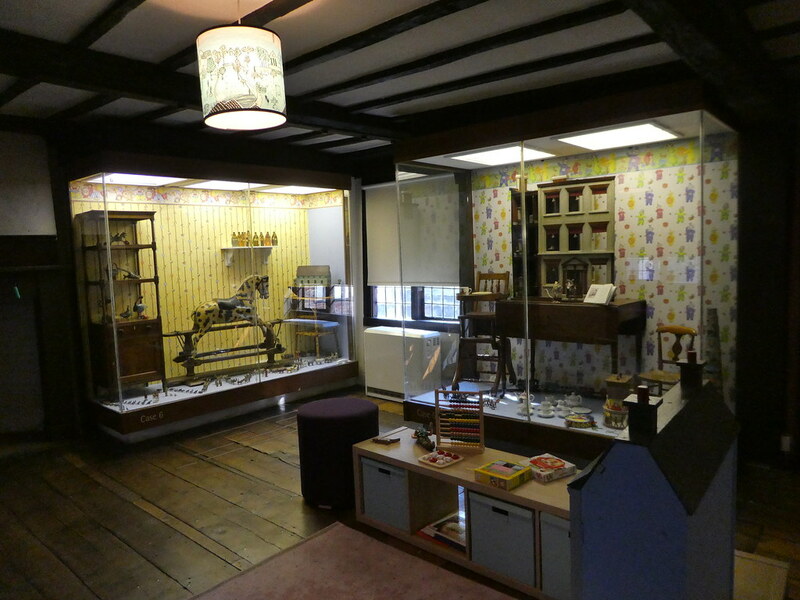 Being fond of visiting toy museums, I was delighted to find that Strangers’ Hall has one of the earliest surviving baby houses of its kind. Baby houses were traditionally created by architects who would either base their designs on a real life property or from someone’s imaginary home. 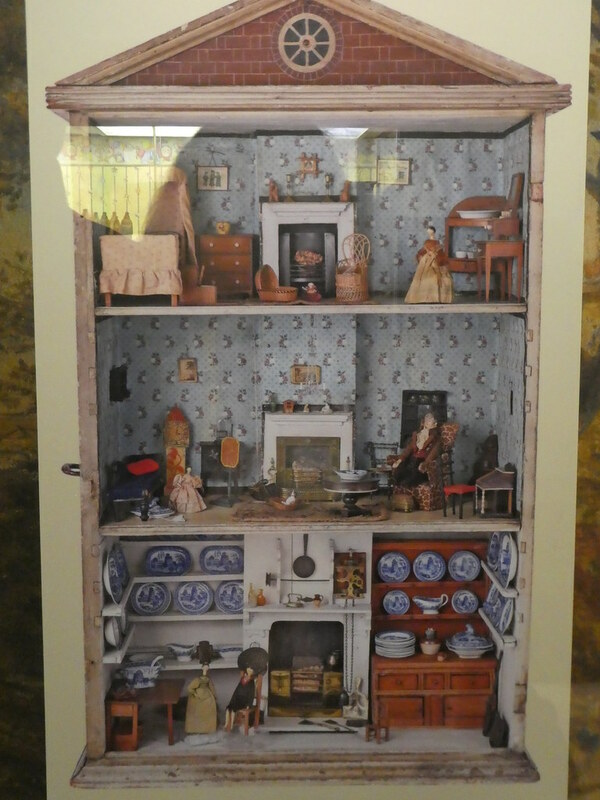 There was also a collection of Victorian dolls and toys to admire, making it an enchanting place to end our visit to the city. By late afternoon, we were back on the train home after having spent a lovely weekend in Norwich. We found lots of fun things to do, interesting museums to explore and even managed to find time for a day at the seaside in Great Yarmouth. I would like to thank Visit Norwich for helping to make this short break possible. As always, all views and opinions are entirely my own. 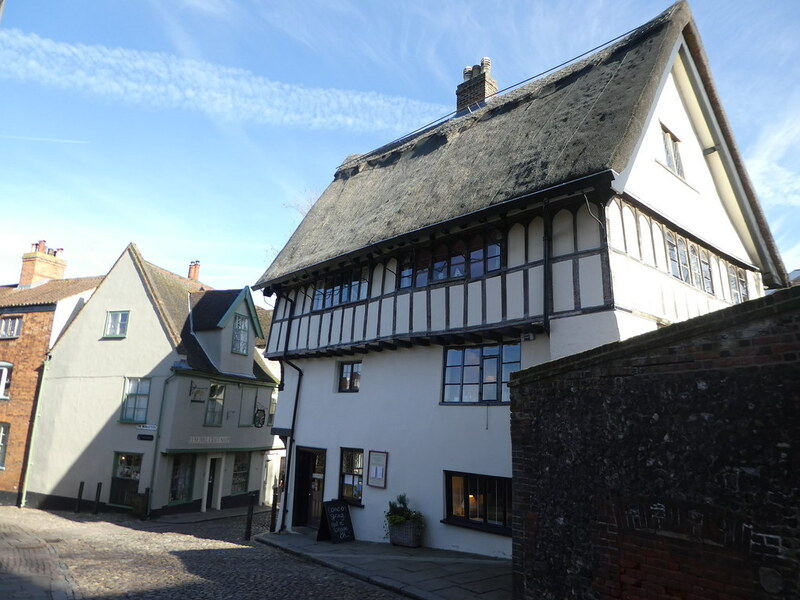 If you have enjoyed reading about our weekend in Norwich, you may also be interested to read about our weekend breaks in other parts of the U.K. The architecture here looks so perfectly Tudor that it seems almost false. I have some spots like this in the town I live and on a late evening or a very early morning if you there are no cars around you feel like you’ve fallen into another time period. I love Tudor architecture and it must make all the difference without passing traffic. LOVE the dishes in Strangers’ Hall. And I like your recipe for the day… a little light exercise followed by a pot of tea & fudge cake. Sounds perfect. Thanks Sheri, it was a perfect end to a lovely weekend in Norwich. Thank you, Norwich is beautiful. Thank you Misha, Norwich is a beautiful small city if ever you get a chance to visit. Loved this blog. Looks like a great wee city. Thanks for your kind words. Norwich is a gorgeous small city and definitely worth a visit! When we were first courting I spent a weekend in Norwich with my husband. We hadn’t been back till my Polish family moved there a year or two ago. It’s rather nice that this post goes back to some of our earlier haunts. 🙂 🙂 Interesting finds, Marion. How nice that my posts brought back fond memories of your early courting days. This was only my second visit to Norwich and my first proper one. Our only other visit was about 20 years ago when we hired a boat on the broads for a week, Moored up just outside Norwich and spent an enjoyable afternoon there, always meaning to return. Thank you. Norwich is lovely. Norwich used to be my closest town where I spent a lot of time.Thank you for bringing back some happy memories. It’s my pleasure Nina. It’s so nice to hear from you and learn that you are enjoying my blog. Really interesting post with some lovely photos. Not been to Norwich for a few years but it was always a good visit. Strangers Hall looks particularly interesting. Thanks Jonno. We had such a lovely weekend n Norwich and hope to return again soon. Thanks for the peep behind the scenes so to speak.. We visited Norwich many years ago but didn’t delve as deeply as you have. All most interesting. It’s always great fun to visit a present which presents such a fascinating past.Thanks again. It’s my pleasure Joy and to so nice to read your lovely comments. Great post! Norwich sounds and looks so beautiful! Norwich is absolutely beautiful and nice and compact to be able to walk around and take in the sights. Thank you for your much appreciated comments Elise. It’s been 40 years since I last visited Norwich so I’ve much enjoyed a trip down memory lane courtesy of your wonderful travelogue. Thank you! Thank you Sheree for your kind words, it’s lovely to read that this series of posts has brought back many happy memories. Thanks Verna for your kind words, it’s so nice to hear from you. 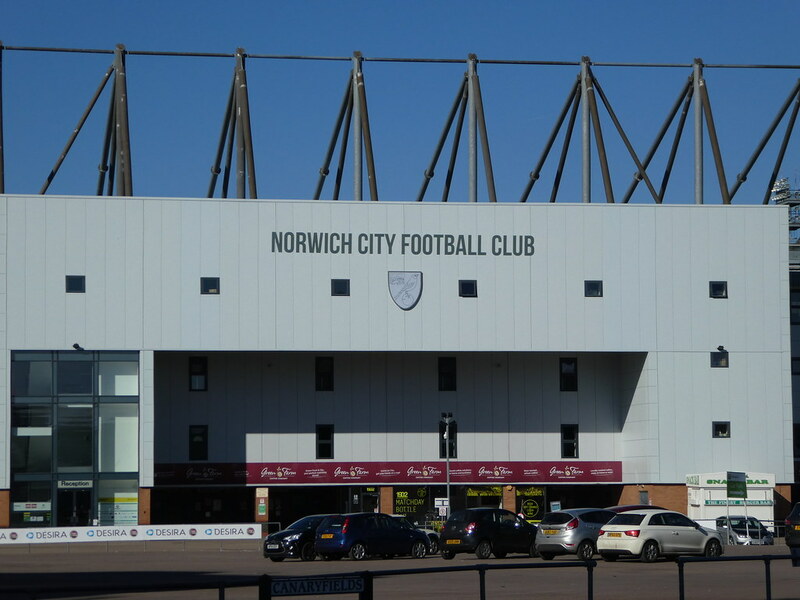 Norwich makes a splendid city break. Thank you, so kind of you to comment.